Includes 31-feet of feed hose, and single chamber filter bad for capturing large debris. Vacuum Inlet : 2 ¼"
The Polaris 360 pressure-side pool cleaner (view larger). The Polaris Vac-Sweep 360 pressure-side pool cleaner works in all in-ground pools and operates without a separate booster pump for maximum energy efficiency. It features all-wheel drive and advanced cleaning technology that is powered by triple jets. The Polaris 360 easily connects to a dedicated pressure line and sweeps, scrubs and vacuums all surfaces of the pool. The pressure cleaner is equipped with a single chamber filter bag where it captures large debris like leaves and pebbles. 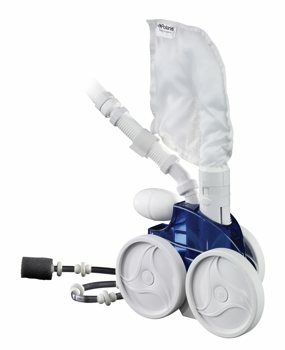 Its unique filter bag removes debris before it reaches your pump basket or filter, prolonging the life of your filtration system. In-line back-up valve automatically frees the 360 if it gets cornered, keeping it cleaning without interruption. Polaris cleaners are the number one recognized brand of pool cleaners worldwide and have enjoyed 40 years as the top selling pressure pool cleaner. The new robotics from Polaris display the same high quality engineering, rugged contruction, and reliability that pool owners have come to expect from the brand. Polaris Polls is part of the Zodiac Pool Systems, Inc. family of products for pool and spa.